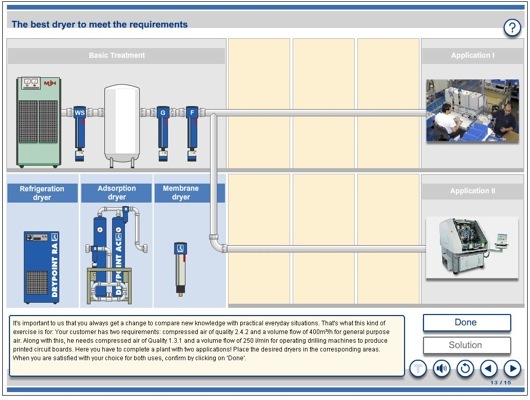 BEKO Technologies is further extending its product range by launching their first e-learning course - “The Basics of Compressed Air Technology”. This innovative course is now available to all customers and partners, giving them the chance to share and benefit from BEKO’s vast experience in compressed air. The course “Basics of Compressed Air Technology” gives an insight into compressed air from the end users point of view. It provides information about applications and their quality requirements as well as how compressed air is produced and distributed. It explains how the quality is influenced by the components and layout of a compressed air system. Throughout the whole course emphasis is placed upon the need to balance quality and energy efficiency. The course is aimed at people new to the industry or at support staff within distributors who need an overview. It is also the first step on a more detailed learning program for those who require it. The e-learning course is available via the BEKO Academy, which is an online learning management system designed by the BEKO Education Centre (BEC) based in Neuss, Germany. BEKO’s 300 employees in 15 subsidiaries benefit from continuous education and training programs from basic knowledge up to advanced technology, including instrumentation, air auditing and oil-free air. The mission of the BEC is to share knowledge, leading to a greater awareness of compressed air and energy efficiency generally. The e- learning system was developed two years ago in Neuss with classes done by product management teams as a trial. Since then it has been developed and refined until it is now fully tested and ready for general release. The eLearning course is the first step on a Blended Learning Scenario which is the basis of the career-long learning program offered to all BEKO employees- setting a new industry quality standard for personnel development.